As spring inches closer, more and more 2017 trends are starting to show up on Instagram, in magazines, and on very stylish people on the street. One of those trends gaining traction is definitely graphic tees. To be clear, graphic t-shirts have always been around – they never really totally went out of style – but they definitely had a much bigger moment back in the early 2000s. This was when everyone was obsessed with graphic tees, from shirts that showed off your personality to ones that displayed your heritage to splashy logos that made it clear you were a girl who shopped in bebe, damnit, not just Wet Seal. 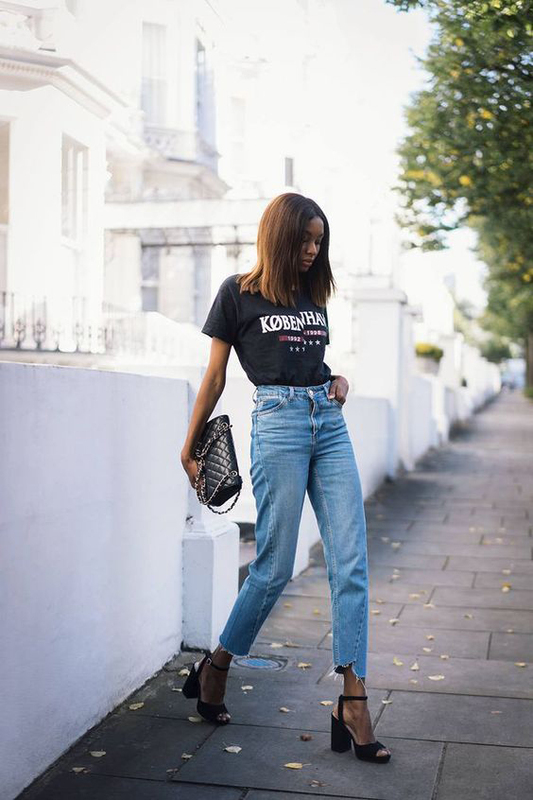 Like so many other early ’00s trends, graphic tees are making a bit of a comeback, so you should expect to see them more than you already do. I suspect that that flashy logo trend is going to re-surface, as well as, of course, band tees and fun images. Whatever graphic you like, make sure you’re styling the shirt with more than just jeans and a pair of sneakers. I mean, do that if you want, it works, but try to have some more fun with them. 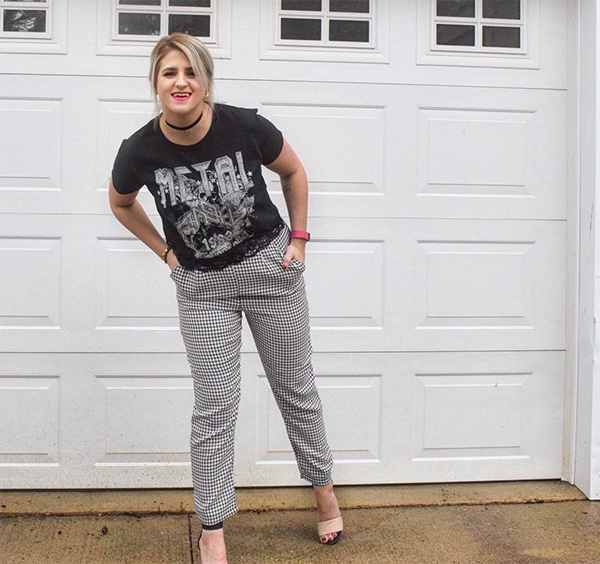 It’s a casual piece that is so versatile and can be a lot more fun than it seems. 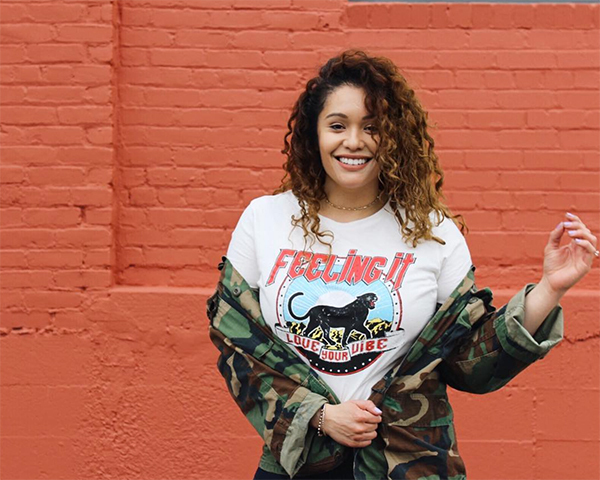 Here are a few style tips on how to wear graphic tees this winter in a way that is definitely not boring. 1. Keep your graphic tee simple but still fun by wearing it under a printed jacket or button-down shirt. Don’t worry about the colors matching or the prints clashing! 2. 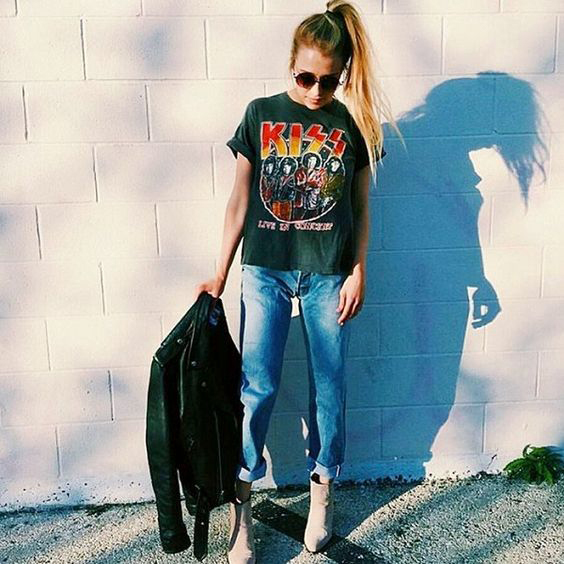 Graphic tees and heels are a match made in heaven. Make the look more interesting by adding cool heels and a leather jacket. It’s a little bit more dressed up without being too over the top. 3. Another way to make a tee and jeans combo more fun: add a long trench and cuff the jeans to show off sneakers. With a glam bag and some pretty jewelry. 4. Take a break from jeans and wear a graphic tee with a pair of printed pants. The colors/patterns can clash, like the look above, but if you’re worried about it, just match shades. 5. Add one super luxe clothing item to your graphic tee and jeans to look a little bit more chic. 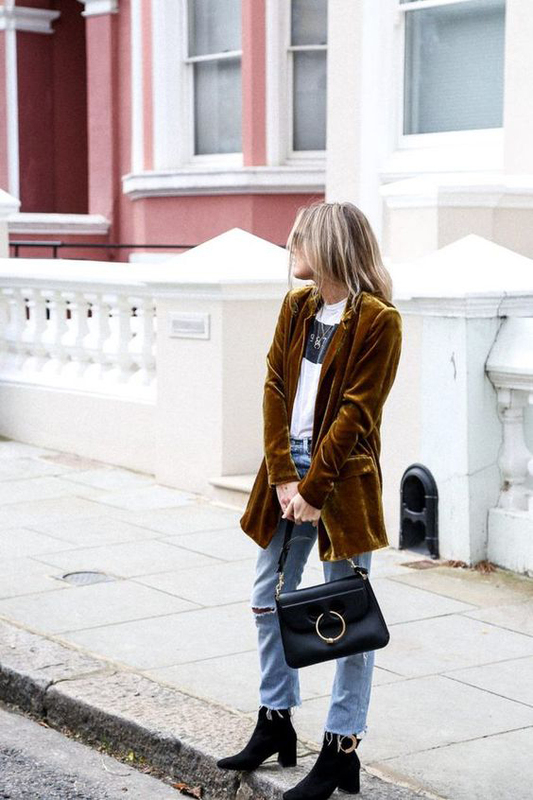 A velvet jacket/blazer like this one is a great option. 6. A leather jacket adds a little bit of edge to a graphic tee while also keeping you warm. Wear a more fitted one as part of your outfit instead of just outerwear. 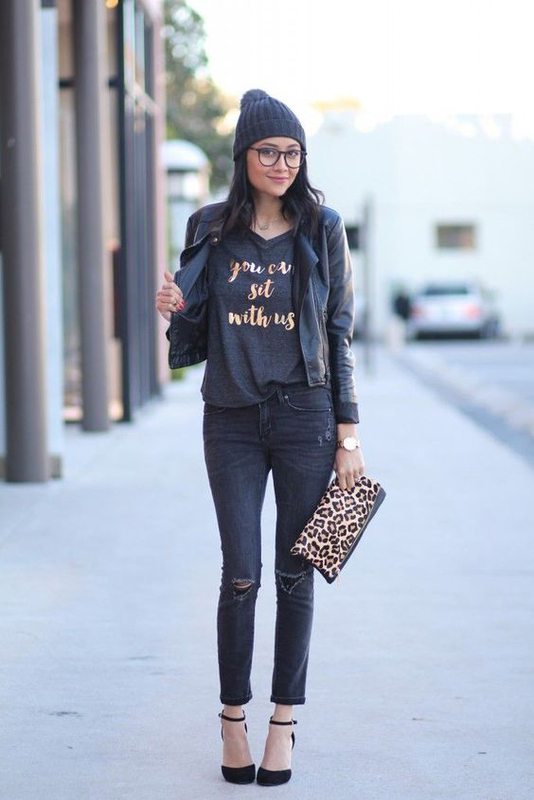 The beanie is another way to keep this look more casual, especially if you wear heels. 7. 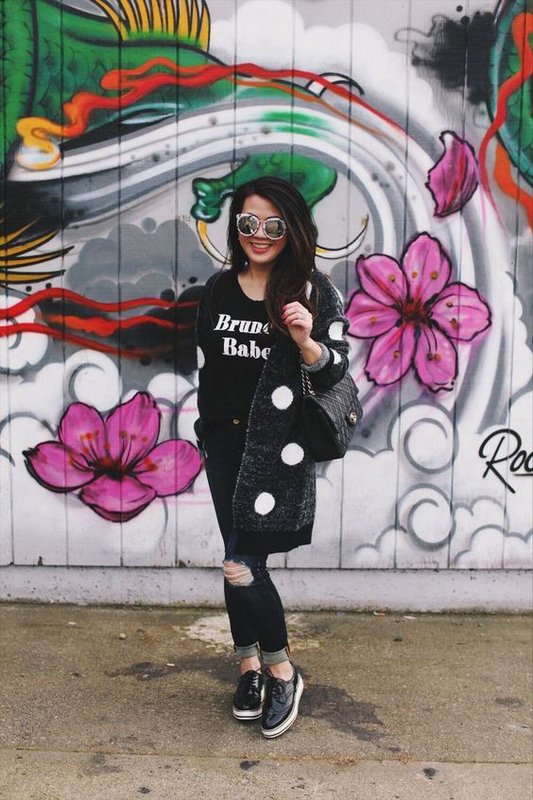 Stay comfortable in a cute outfit by pairing your graphic tee with a fun cardigan, like something with oversized polka dots. Interesting accessories, like bright sunglasses. 8. Ankle boots can take a jeans and tee combo and make it instantly a little more dressed up. Pick ankle length jeans or cuff yours to really show off the boots. 9. 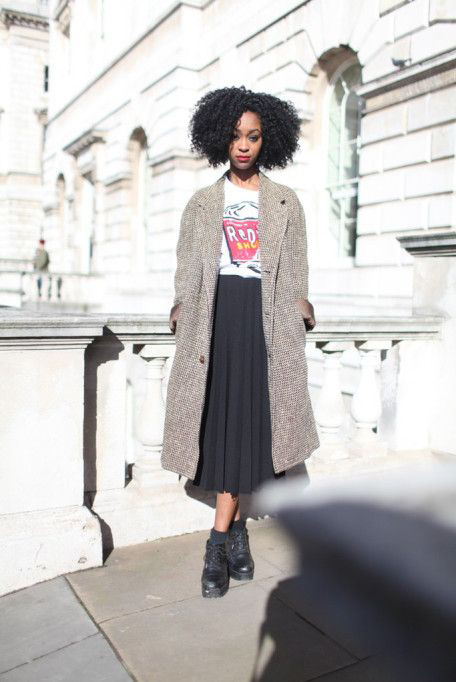 Wear your fave graphic tee with a skirt, cardigan, and tights. Add boots, and you’ve got a cute, easy outfit that looks slightly more professional. 10. 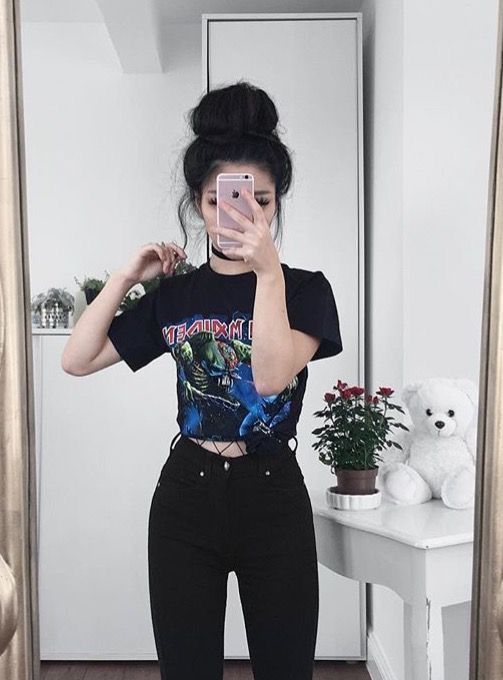 Ripped, loose jeans are also having a moment, so why not wear them with a graphic tee? To keep this from being too casual, front tuck the shirt and add a pair of heels. 11. 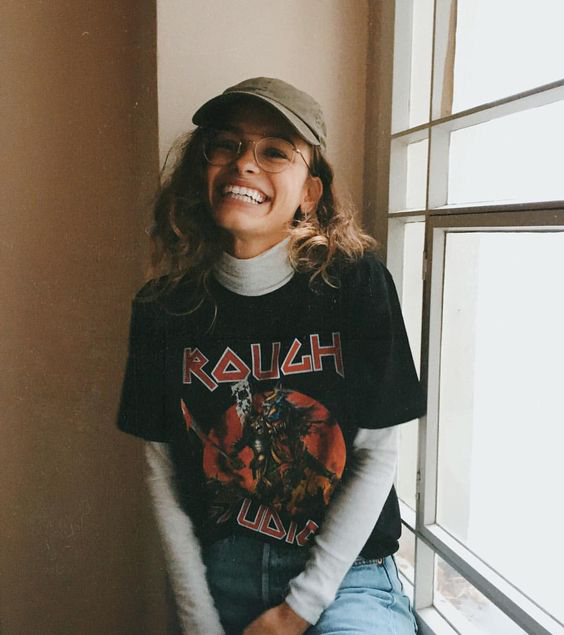 Layer your graphic tee over a turtleneck to stay cozy and look seriously adorable. Bonus points if you have a cute hat to put on too. 12. Get in on the fishnet trend with your graphic tee. 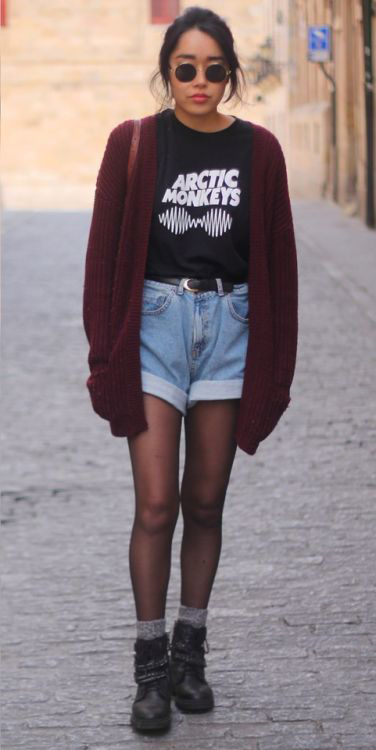 Pull the fishnets high, then knot your tee into almost a crop top to show off the waistband of the tights. 13. Get your denim shorts ready for warmer weather by wearing them over tights. 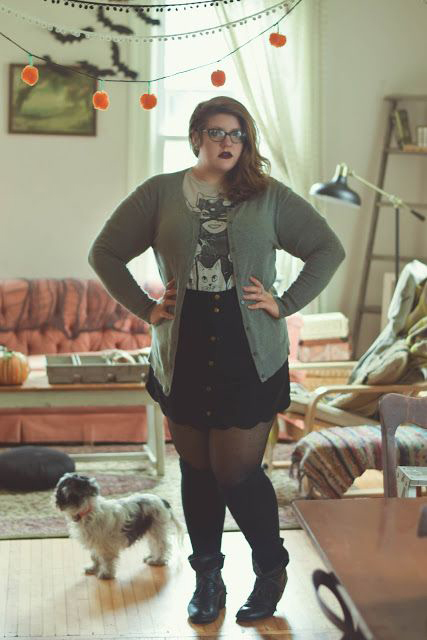 A graphic tee and colorful cardigan keep the look easy and comfortable, while knit socks and boots keep you warm. 14. Do something a little bit more daring – wear a graphic tee that’s long/big enough to be basically a dress with a pair of thigh-high boots. 15. 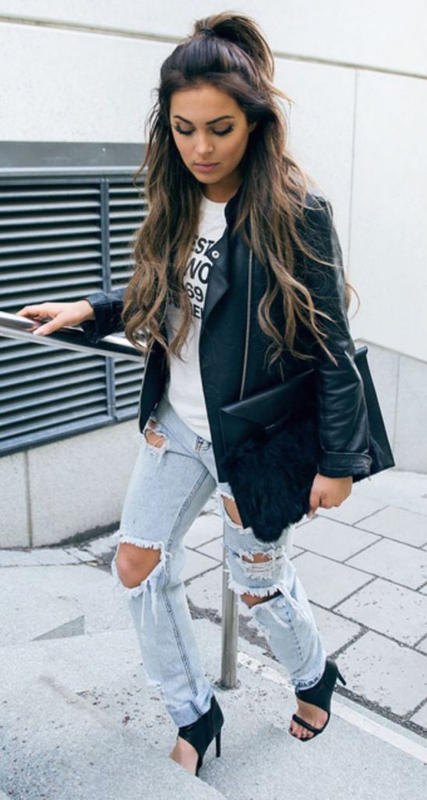 Accessories can change your whole look – knee-high boots and a Panama hat keep jeans and a t-shirt looking more on the chic side. 16. Dress up your tee a bit by tucking it into a midi skirt. A long jacket or cardigan with ankle boots keeps this appropriate for winter weather. 17. Keep things interesting and layer your graphic tee under a thin-straped dress, whether it’s velvet, a slip dress, or just something basic. 18. 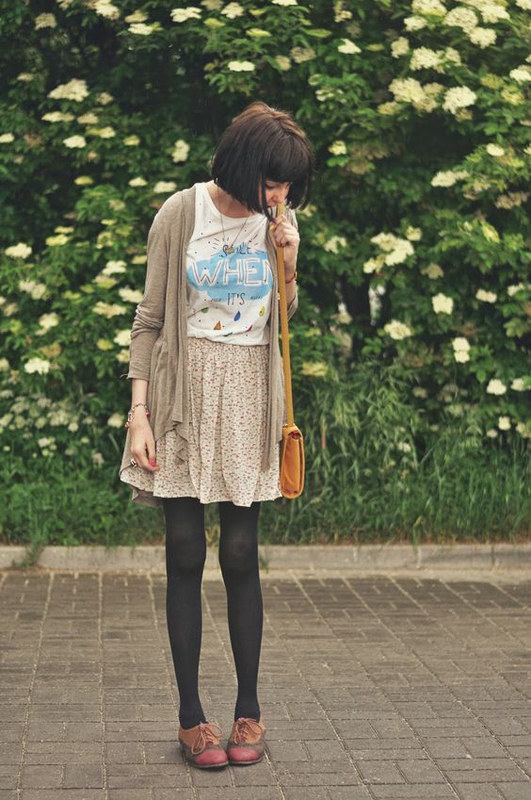 A floral skirt, tights, and a pair of Oxfords keep a graphic tee looking a little bit more preppy than usual. 19. 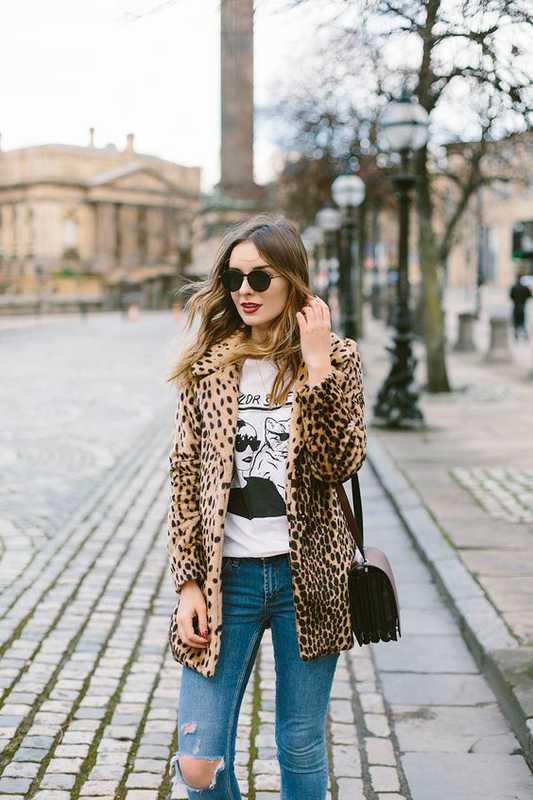 Add an unexpected piece, like a leopard jacket, to make your look stand out. Red lipstick and a nice bag make this look chic. 20. Tuck your tee into high-waist fit flare jeans with ankle boots or heels. So many trends, but this still manages to look extremely cool.